I am loving the pirate theme. I'm excited to get into the classroom and start decorating. I can't do anything until I return to the states in August. I will have exactly 2 weeks to prep! Not a lot of time. I made this first day of school coloring activity. Perfect for morning work. 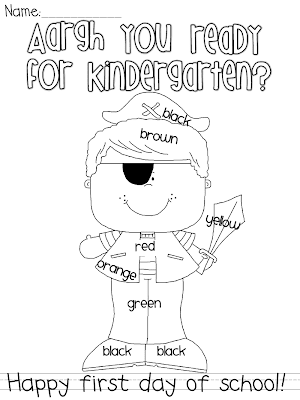 Plus, you can easily assess who can color and who knows their colors. I just found your blog and it is freakin adorable!!!! 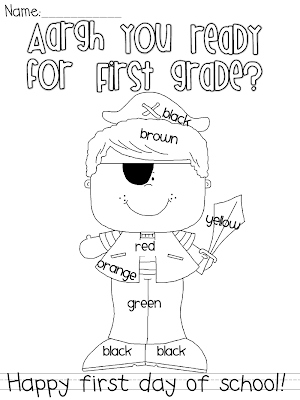 Are you able to make one of the pirate first day colouring pages for Grade 1??? I would love to do a jungle one for the first day of school! Any idea where to get the clipart? Also, what font did you use? This is such a cute site. I am doing a pirate theme for my second graders this year. Would it be possible for you to add a welcome to second grade also. Thanks in advance. 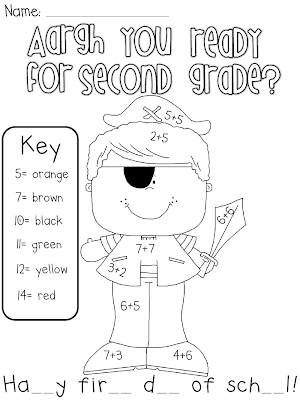 Thank you so much for adding the second grade pirate theme first day printable. I am so excited! Please continue to add more. I just found your blog and love it. I was planning to do a pirate theme for my K-2 autism program this fall and I am so excited about all the resources you have provided. Thank you! I used it last year for First Grade! I have been moved up to Third Grade now!! Could you please make one of these for Third Grade? Is there anyway you might be able to create a Pre-Primary version for us Aussies?